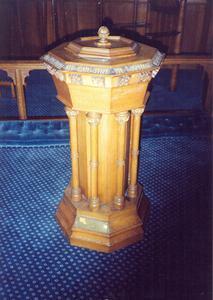 Brass plaque fixed at the base of the font, and carved inscription around the top rim of the font. (Carving at top of font): TO THE GLORY OF GOD AND IN LOVING MEMORY OF HENRY WILLIAM HOWELL COLLETT (Plaque): PRESENTED TO THE TRUSTEES OF THIS CHURCH BY HIS PARENTS AND / BROTHERS. IN GRATEFUL REMEMBRANCE OF A NOBLE LIFE LAID DOWN / IN BATTLE ON JULY 30TH 1916. HIS SIMPLE FAITH IN JESUS CHRIST / HEROISM IN SERVICE, CHEERFULNESS IN FACE OF DANGER, TOGETHER / WITH HIS VICARIOUS DEATH ARE A PRECIOUS HERITAGE. AND BY / THESE "HE BEING DEAD YET SPEAKETH". HEBREWS XI. CHAP. 4.V.